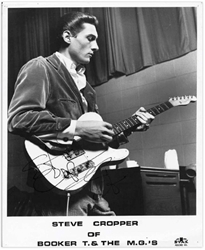 Guitar legend Steve Cropper recalls his brush with Beatles. Beatles Radio: The Beatles, Solos, Covers, Birthdays, News The Fab 4 and More! Apparently the Fab Four were fans of Cropper's guitar playing, and his production work with artists like Otis Redding--who he cowrote "(Sittin' On) the Dock of the Bay" with. The story goes that Beatles manager Brian Epstein travelled to the famed Stax Studios in Memphis to see about recording there, so I asked Cropper if that story was true.